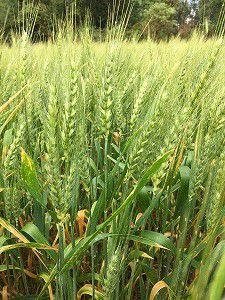 The importance of plant development in increasing crop yield potential has become more and more evident since the beginning of the green revolution, since then there has been considerable work done to enhance these developmental traits which has led to improved crop performance. There are several developmental features of plants, such as overall plant architecture, leaf features and vasculature make up, which are the major traits that determine the overall performance of crop plants. Scientists are now beginning to examine the influence of microorganisms on these crop developmental features. Plants and microorganisms have coexisted for millions of years. Plants maintain a complex interaction with soil biology, which is crucial for nutrient availability and uptake, plant development and disease and pest protection. These mutually beneficial associations are possible because plants and microorganisms can communicate with each other through various signalling mechanisms. Plants produce a wide range of organic compounds including sugars, organic acids and vitamins, which can be used as nutrients or signals by microbial populations. On the other hand, microorganisms release hormones, and other volatile compounds, which may act directly or indirectly to activate plant immunity or regulate plant growth and morphogenesis. The diverse range of microorganisms found in the soil food web produce substances that regulate plant growth and development. These very crucial substances including auxins and cytokinins can affect cell creation in the shoot and root development (specifically more fibourous root hairs) which can increase nutrient and water uptake. Gibberellins are also very important, and are the most studied plant growth regulator; this substance regulates the growth and influences different developmental processes which include stem elongation, germination, flowering and enzyme induction. 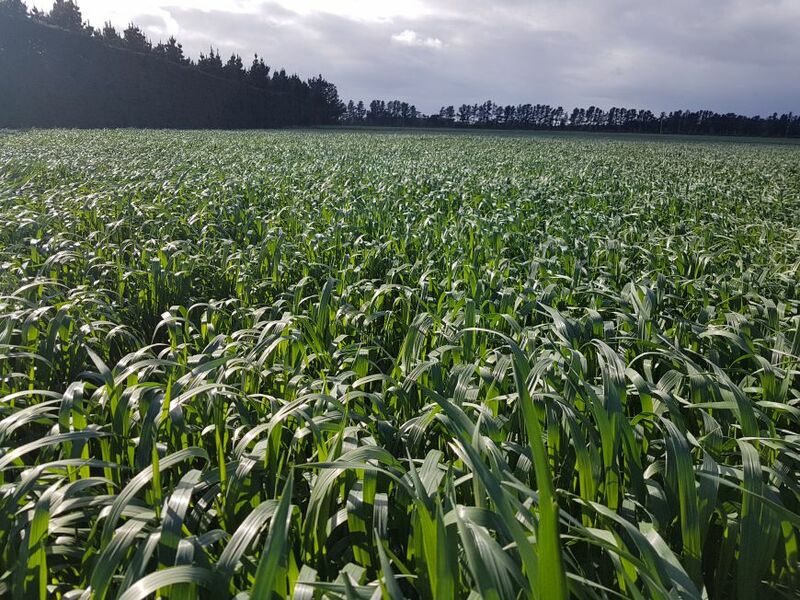 We often talk about how EM can stimulate resident biology, breakdown soil organic matter or enhance fertiliser inputs, but one of the many other actions is the production of what are called, plant growth regulators (PGR). Auxins, cytokinins and gibberellins fall under this umbrella. These PGR’s are hormones, and have an important role in plant growth. 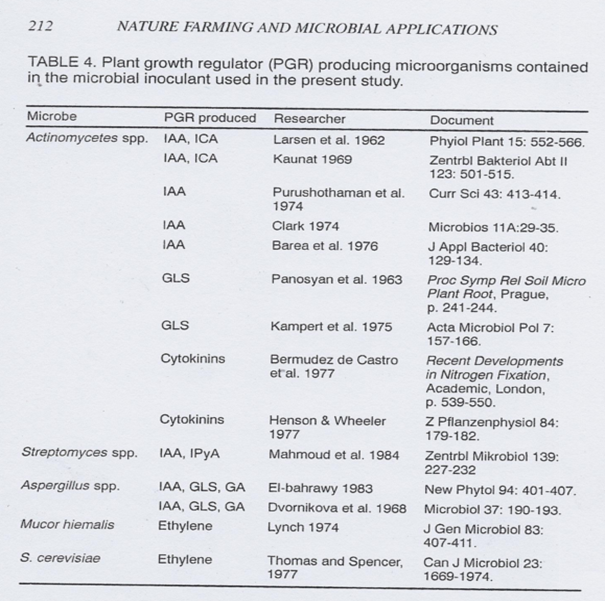 The microbial species listed here in this table (extracted from the book Nature Farming and Microbial applications), are all present in EM, and have all been shown to produce various PGR’s as published. These include the above mentioned Auxins, Cytokinins and Gibberellins among others. Note that GA stands for Gibberellic Acids and IAA stands for Auxins. Ethylene is a naturally occurring substance, which was one of the first plant growth regulators to be discovered and used successfully for enhancing ripening in fruit. EM Magazine nr 20 in aantocht !